Set hearts aflutter with our enchanting Magic Butterflies! 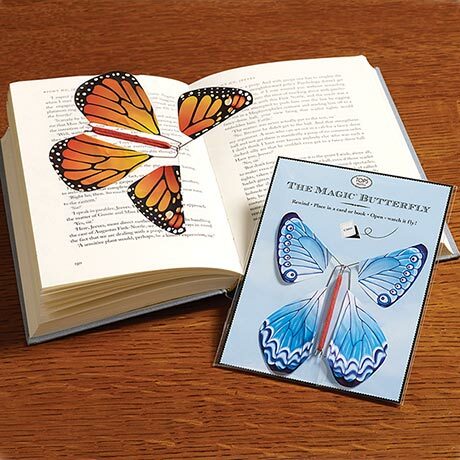 Simply wind the wings in a circular motion and place the paper butterfly in a card (or a book!). When the recipient opens the missive, the lovely butterfly takes flight, for a joyous surprise! (You might want to issue a gentle warning to anyone who's easily startled.) Perfect for birthdays, weddings, and other special occasions, these ingenious little "creatures" - which can be reused over and over again - deliver soaring declarations of love and good cheer. We're offering a set of two: one regal monarch and one bright blue beauty.